Sharks are the largest and sharp predator fishes that live all around the oceans. They have been dwelling in the ocean for more than 2 million years. There are 465 different species of sharks that live in the oceans. The biggest species of the sharks is called great white shark. A fully grown shark sits on the top of the ocean’s food chain. They have very few predators to avoid, which are others sharks and orca whales. Great white shark is the biggest of all the other sharks. They grow about 20 feet in length and can weigh as much as 4000 pounds. Their underbellies are light colored and their top is dark colored. This color difference gives them an excellent camouflage. When sharks are seen from above, their dark color blends with the dark floor of the ocean. When seen from below their light color blends with the sky. Great white sharks are equipped with 3 fins, which are dorsal fin, pectoral fins, and caudal fins. Sharks are carnivore fishes; they eat other fishes for their diet. Sharks are very good hunters. They have a sense of smell that can detect a drop of blood from miles away. They have very sharp triangular shapes teeth arranged in 7 rows. A fully grown shark mostly eats sea lions, seals, and other sea mammals. They don’t have a tongue for tasting. Instead, their whole mouth can taste the food. Sharks can lose a couple of teeth in hunting a prey. But, the new teeth are grown very fast. Sharks prefer to live in cold waters in the oceans. They are mostly found close to the shores where the ocean water is cold. They are commonly live down to a depth of 2000 meters. However, they can go beyond this depth. Great white sharks are considered as endangered species around some parts of oceans. Their population has reduced due to over-hunting. Sharks need a constant water flow over their gills to extract oxygen for respiration. They need to constantly move with their mouth open. Even, they need to move in the ocean during sleep otherwise, they may drown. 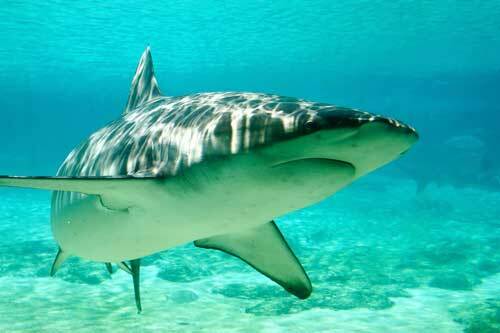 Bull shark has the ability to live in both fresh water and ocean. A great white shark grows about 50,000 teeth in its life time. They lose a couple of teeth in every hunt and regrow them. Abdul Wahab, "Shark," in Science4Fun, April 13, 2019, http://science4fun.info/shark/.